Some of the best research in the world comes from Wall Street. It has long been a leader in providing investors with ideas and strategies for investing. At the same time, it is important not to paint all Wall Street research with the same brush. Not all of Wall Street is the same, and some of the research it produces poses certain risks. The “Chinese” wall exists to ensure that research analysts aren’t influenced by the desire of investment bankers to get deals. That wall is not always as solid as outsiders might think. After the tech bubble, investigations revealed that analysts got paid to help the firm win more IPO business by writing positive reports on stocks they knew were not so good. For instance, one analyst sent an internal e-mail calling a company “such a piece of crap” on the same day his firm published a “Buy” rating on the stock. That company, Excite @ Home, filed for bankruptcy the next year. One might hope that the punishments handed down in the $1.4 billion Global Research Settlement would prevent conflicts of interest affecting research ratings, but that doesn’t seem to be the case. In 2014, the Financial Industry Regulatory Authority (FINRA) fined 10 banks for allowing their analysts to participate in the pitching process for the Toys “R” Us IPO. “I would crawl on broken glass dragging my exposed junk to get this deal,” one analyst wrote to his colleagues. It’s understandable why Wall Street analysts would end up getting pressured to help out the investment bankers. After all, equity research is a cost center and does not directly generate any revenue. Revenues come primarily from trading and underwriting, with IPO’s usually offering the biggest paydays. Analysts that don’t help the firm bring in more deals get fired, even if their ratings are accurate. See Fortune’s “The Price of Being Right”. Plus, the competition for the big paydays from deals heightens the pressure on analysts. In the example above, 10 banks were pitching Toys “R” Us. Every bank knew they had to offer favorable analyst coverage as part of the package, or the retailer would go with one of their competitors. 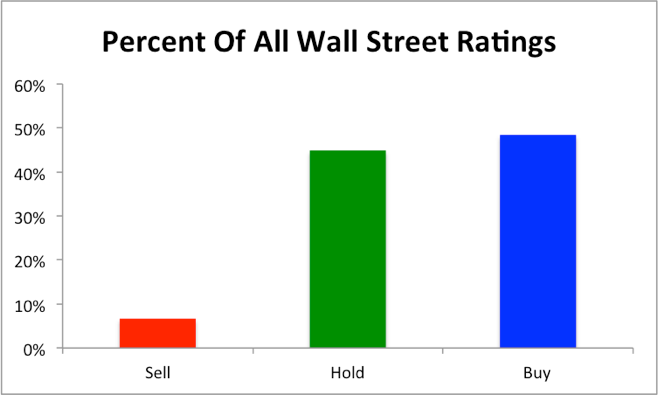 Not surprisingly Wall Street ratings have a significant positive bias. An analysis from Bespoke Investment Group found that, of the 12,122 ratings out there for all stocks in the broad market index, less than 7% were labeled sells, as shown in Figure 1. The best way to make money is to be one step ahead of other investors. Sometimes it can be hard to distinguish between “scoop” and inside information. Before Reg FD, Wall Street analysts thrived on passing inside information to their biggest and best clients. That habit is hard to break. 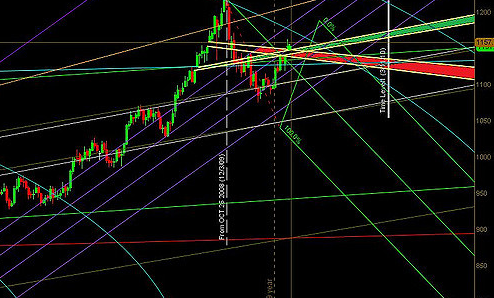 It is not surprising that analysts are still trying to find ways to get an edge. As a result, most professional investors know that an analyst’s published research might not always tell the whole story. To get the whole story you have to meet with the analyst in person or attend an “idea dinner”. A recent FINRA fine involved analysts holding “idea dinners” where they offered opinions that sometimes contradicted their published ratings, such as highlighting a “short” call that they’d upgraded to “hold” in public. Sometimes there are reasonable explanations for these contradictions. Maybe new information has changed the analyst’s opinion but they haven’t had the chance to update their report. Maybe the individual investors they’re talking to have a different timeframe from the general public. In other cases, analysts might avoid publishing negative research in order to maintain a good relationship with executives. The top investors get word from the analyst to sell, but ordinary investors reading the research reports still see a “Buy” rating. Ultimately, the clients at these “idea dinners” have privileged access because they trade more, and are therefore more valuable to the bank. Consequently, they get a different level of information than those without direct access to analysts. And that’s the real message here. There are a lot of really smart and dedicated analysts on Wall Street, but their interests are not always aligned with the average investor’s. Sometimes, the analyst’s goal to make money for his or her firm overrides the desire to serve the best interests of investors. The models used by most sell-side analysts tend to rely on accounting earnings or, even worse, non-GAAP earnings. Since CFO’s agree that 20% of companies have misleading earnings, those numbers are not reliable. However, there’s no real incentive for analysts to do the hard work required to reverse accounting loopholes and get to the underlying economics of a business. The lack of conviction behind investment research explains why, for instance, Goldman Sachs has already reversed itself on five of its six big calls for 2016. Investors that based their strategies around those calls this year are now faced with some difficult decisions. The bottom line is that investors should not be making decisions based solely on Buy and Sell calls from Wall Street. There are plenty of cases where a “Buy” is not really a “Buy”, as highlighted by Integrity Research. Whether it’s to keep the boss or a big client happy, to maintain a relative sector balance, or simply due to being overworked, these ratings can be influenced by many factors besides fundamentals. As we state at the beginning of this article, Wall Street provides some of the best research in the world. The connections that many analysts can make with executives sometimes give them unique insight into companies. They can offer valuable commentary on industry trends. There are, however, certain conflicts ingrained with the way Wall Street does business. There is real value in incorporating an independent perspective. Investors deserve research that gets to the core drivers of valuation. They deserve independent due diligence because it is part of fulfilling fiduciary duties and it tends to pay. This diligence helps us to identify stocks that are poised to blow up. As just one example, three months ago, we put Qlik Technologies (QLIK) in the Danger Zone. At that time, 21 out of 27 analysts had Buy or Overweight ratings on the stock, and no one had Sell recommendations. Since that date, the stock is down almost 40%. Here are several more examples where an independent perspective paid off. 1 Response to "Why Investors Need Independent Research"
If everything is balanced, shouldn’t all three choices be 33.3% based on fundamentals with a big discount based on executive compensation. Numbers don’t lie but people do.